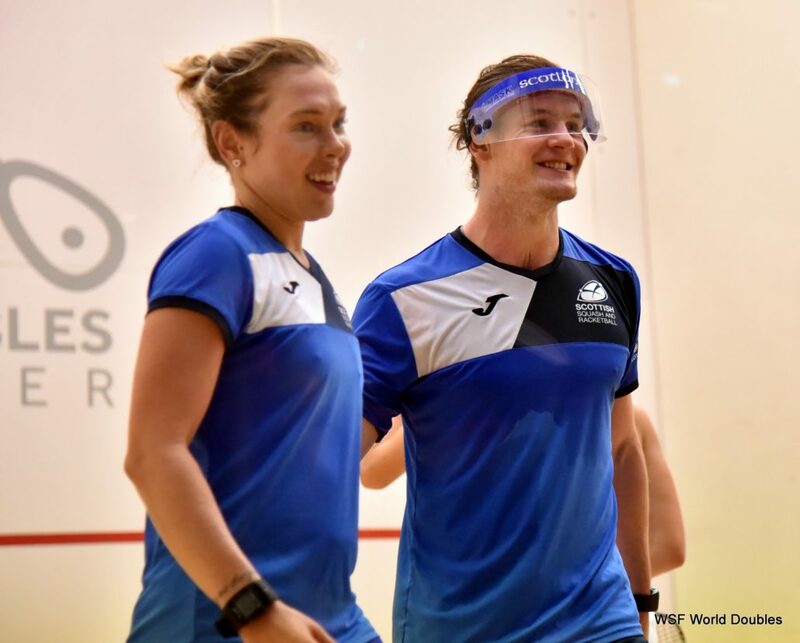 Mixed doubles pair Doug Kempsell and Lisa Aitken shocked top seeds and defending champions Joelle King and Paul Coll from New Zealand this morning as they secured a place in the quarter-finals of the WSF World Doubles Squash Championships in Manchester. In an epic three game battle the Scots came out on top against the Kiwis 11/7, 5/11, 11/9. They then defeated home favourites Adrian Waller and Victoria Lust 9/11, 11/6, 11/4 this evening to secure a safe passage into the last eight. Unbeaten Kempsell and Aitken play South Africans Christo Potgieter and Milnay Louw at 11am on Thursday in their final Group A match before the knock-out stages. It follows their win over Welsh pair Joel Makin and Deon Saffery, 11-3, 11-3 yesterday. 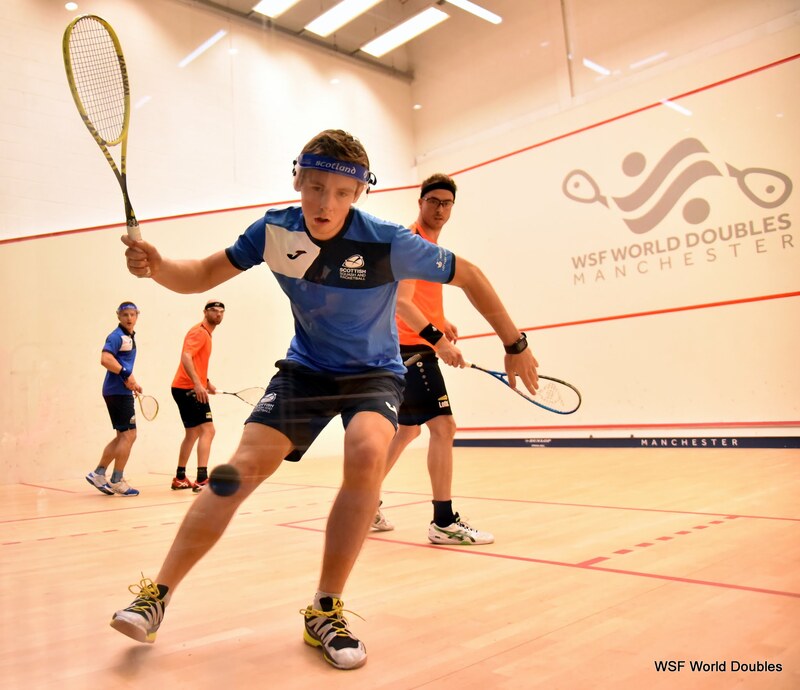 Men’s doubles world champions Alan Clyne and Greg Lobban made it three wins from three in Group A after a comprehensive 2-0 (11-2, 11-5) win over Dutchmen Dylan Bennett and Piedro Schweertman this morning. 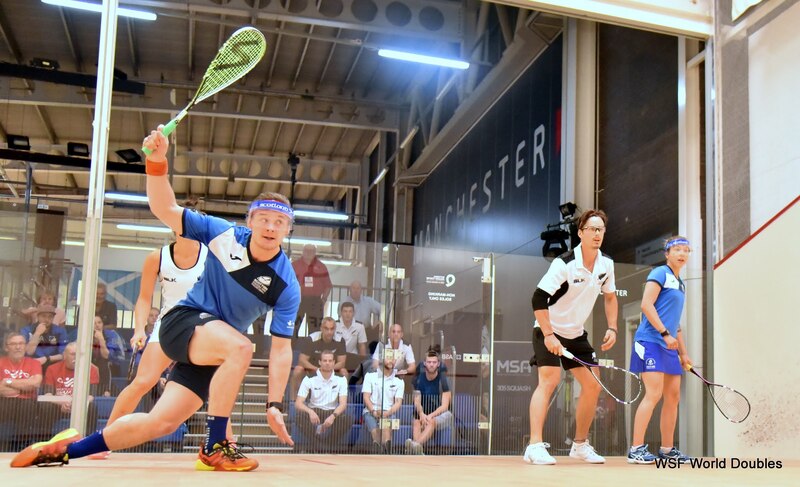 The Group A table-toppers defeated Indian pair Vikram Malhotra and Mahesh Mangaonkar yesterday, 11-1, 11-6, and Malaysia’s Adnan Nafiizwan and Ivan Yuen 11-3, 11-8. Clyne and Lobban play their quarter-final match tomorrow evening. Meanwhile Kevin Moran and Doug Kempsell defeated Canadian duo David Baillargeon and Shawn Delierre in a gripping Group C clash, 11-6, 6-11, 11-7 to keep their quarter-final hopes alive. 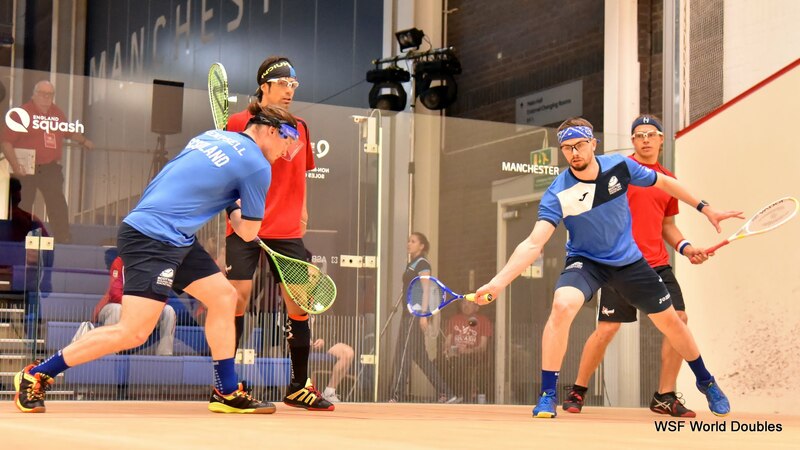 The Scottish Men’s Doubles Champions know that victory tomorrow against England’s Declan James and James Willstrop can book them a place in the knock-out stages of a tight group. 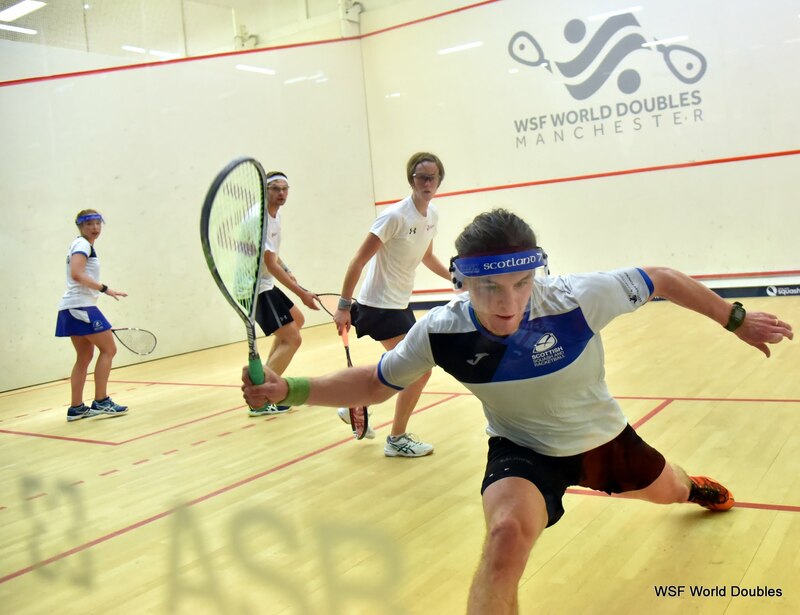 They lost a tough opening match against Kiwi champions Paul Coll and Campbell Grayson, 11-9, 11-6 on Tuesday. 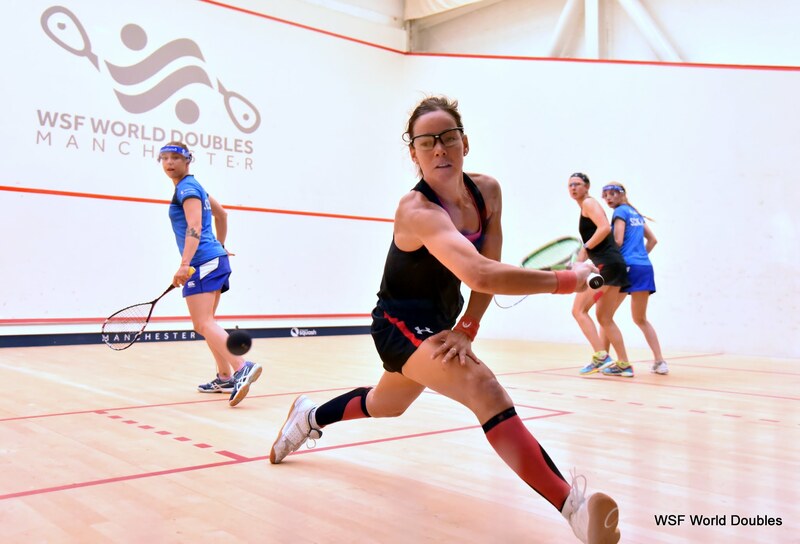 In the women’s doubles Carrie Hallam and Lisa Aitken saw their last eight hopes ended as they lost to Jenny Duncalf and Alison Waters 11/4, 11/1 earlier today. 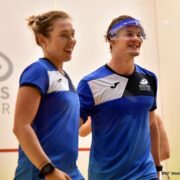 They lost to English pair Laura Massaro and Sarah-Jane Perry, going down 11-6, 11-10 on Tuesday before a win over South African’s Alexandra Fuller and Cheyna Tucker 11-7, 11-8 in Group D.
This evening in Mixed Doubles Group C, Carrie Hallam and Chris Leiper lost to Australian’s Cameron Pilley and Donna Urquhart, 11-2, 11-4. 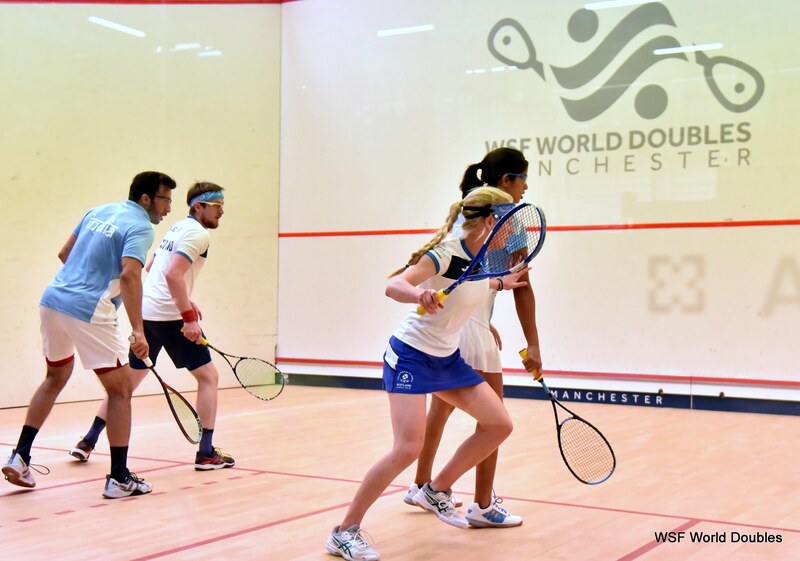 On Thursday morning, 11.45am, they play Columbian duo Andres Herrera and Catalina Pelaez and then Kiwis Zac Millar and Amanda Landers-Murphy at around 3.15pm having lost yesterday against India’s Vikram Malhotra and Joshna Chinappa, 11-5, 11-6.